32 Myths About The Flu Vaccine You Don't Need To Fear : Shots - Health News Vaccination isn't a perfect defense against flu. But vaccines remain the most reliable way to reduce the risk from an illness that causes thousands of deaths in the U.S. during a typical flu season. Joseph Robert gets a flu shot at the Metropolitan Multi-Service Center in Houston during the Falls and Flu Prevention Day, sponsored by the National Council on Aging and Sanofi Pasteur, on Sept. 26, 2013. Brace yourselves: Flu season is coming. And along with the coughing, fevers and aches, you can expect a lot of unreliable or downright wrong information about the flu vaccine. Many people underestimate the health risks from flu. Thousands of Americans die from flu-related complications in a typical year, and last season's H1N1 strain hit young adults particularly hard. Flu and pneumonia combined consistently rank among the top 10 causes of death in the U.S., according to the Centers for Disease Control and Prevention. It was ranked eighth in 2011, the most recent year for which data are available. 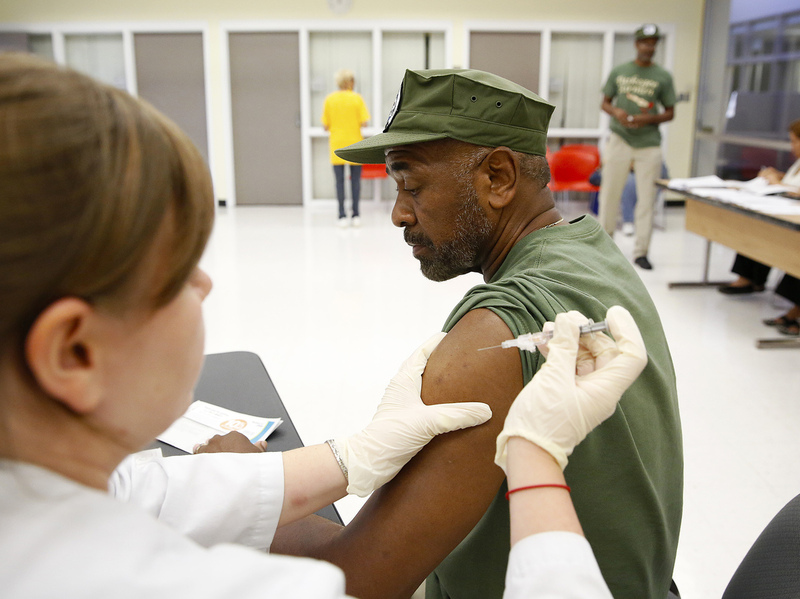 Getting a shot (or an immunizing spritz up the nose) isn't a perfect defense against flu. Some years the strains used to make vaccines aren't a good match for the type of flu that eventually strikes. But vaccination remains the most reliable way to reduce the risk for illness. The Centers for Disease Control and Prevention recommends that everyone 6 months of age and older gets vaccinated against flu every year, with rare exceptions, such as those with severe, life-threatening allergies to flu vaccine ingredients or potentially those with a history of Guillain-Barré syndrome following a previous flu shot. The options for the flu vaccine this year include a shot that protects against the three different flu strains the World Health Organization predicts will be circulating. There are also shots that include protection against four strains. And adults ages 65 and have the option to get a high-dose flu shot, yet another variation. Traditionally, flu vaccines have been made using chicken eggs, but new technologies have led to two relatively new vaccines without a trace of egg. The nasal spray uses four live flu virus strains that have been weakened. The CDC recommends kids ages 2 to 8 get the spray instead of the shot when available, though healthy adults up to age 49 can also get the spray. The live-flu vaccine isn't recommended for pregnant women, older adults and people whose immune systems are compromised. Now is when doctor's offices, drugstores and many companies offer vaccinations in preparation for the upcoming flu season, which typically lasts from October to April. So it seemed like the right time to round up a list of common misconceptions about the flu vaccine and some information to set them straight. Each fact links to a more detailed explanation on Red Wine and Applesauce, a blog where I write about parenting, health and science. Those posts contain links to peer-reviewed research and other sources. If you have specific questions about vaccination, including which type of vaccine is appropriate for you, consult your doctor or other health professional. Myth #1: You should fear Ebola more than the flu. Fact: Flu kills more people in a year in the U.S. than Ebola has killed in the history of the world. Myth #2: You don't need the flu vaccine this year if you got it last year. Fact: You need a new flu shot each year because the circulating strains change and immunity from the vaccine fades. Myth #3: The flu shot is a "one size fits all" approach that doesn't make sense for everyone. Fact: You have many flu vaccine options, such as the shot, including egg-free versions, and a nasal spray. Myth #4: The flu shot makes some people able to only walk backward. Fact: The condition of a young woman who could apparently only walk backward after getting a flu shot was found to be psychological, not neurological. Myth #5: Deaths from the flu are exaggerated. Fact: Thousands of people die from flu in the U.S. in a typical year, including more than 20,000 in the 2006-2007 season. Myth #6: The flu vaccine can give you the flu. Fact: The flu shot can't give you the flu because the virus it contains has been inactivated or severely weakened. Myth #7: Flu vaccines contain dangerous ingredients, such as mercury, formaldehyde and antifreeze. Fact: Flu shot ingredients are safe, but people with allergies to ingredients in some vaccines, such as gelatin, should avoid vaccines with those ingredients. Myth #8: Pregnant women shouldn't get the flu vaccine. Fact: Because influenza can cause miscarriages, pregnant women should get vaccinated against flu to lower the miscarriage risk. Myth #9: Flu vaccines can cause Alzheimer's disease. Fact: There is no link between flu vaccination and Alzheimer's; flu vaccines protect older adults who are at increased risk for flu-related health consequences. Myth #10: Pharmaceutical companies make a massive profit off flu vaccines. Fact: They're a tiny source of profit and are made by only a handful of companies. Myth #11: Flu vaccines don't work. Fact: Flu vaccines reduce the risk of flu, though their effectiveness in any particular year varies. Myth #12: Flu vaccines don't work for children. Fact: Flu vaccines effectively reduce the risk of flu for children ages 6 months and up. Myth #13: Flu vaccines make it easier for people to catch pneumonia or other infectious diseases. Fact: Flu vaccines reduce the risk of pneumonia and other respiratory illnesses or complications from the flu. Myth #14: Flu vaccines cause heart problems and strokes. Fact: Flu shots reduce the risk of heart attacks, strokes and other cardiovascular events. Myth #15: Flu vaccines can damage a protective barrier between the blood and the brain in young children, hindering their development. Fact: Flu vaccines have been found safe for children 6 months and older. Myth #16: Flu vaccines cause narcolepsy. Fact: A European vaccine against the swine flu in 2009 was linked to narcolepsy, but the U.S. seasonal flu vaccine does not cause narcolepsy. Myth #17: The flu vaccine weakens your body's immune response. Fact: The flu vaccine prepares your immune system to fight influenza by stimulating antibody production. Myth #18: The flu vaccine causes nerve disorders such as Guillain-Barré syndrome. Fact: Only the 1976 swine flu vaccine was linked to Guillain-Barré syndrome, and influenza is more likely to cause the nerve disorder than the flu vaccine; the CDC says those with the Guillain-Barré should consult a doctor before getting the flu shot. Myth #19: The flu vaccine can cause neurological disorders. Fact: Neurological side effects linked to flu vaccination are extremely rare (see Myth #18); children with neurological disorders are actually at the highest risk for flu complications. Myth #20: Influenza isn't that bad. Or, people recover quickly from it. Fact: Influenza can cause fever, muscle aches, cough, headaches and a sore throat for one to two weeks. Myth #21: People don't die from the flu unless they have another underlying condition already. Fact: Otherwise healthy people do die from the flu. The elderly and young children are most vulnerable. Myth #22: People with egg allergies can't get vaccinated against flu. Fact: People with egg allergies can get a flu shot but should consult their doctor or allergist on options if their allergy is severe. Myth #23: If I get the flu, antibiotics will help me get better. Fact: Antibiotics can't treat a viral infection. Myth #24: The flu shot doesn't work for me, personally, because last time I got it, I got the flu anyway. Fact: The flu shot cannot offer 100 percent protection against the flu, but it reduces your risk of getting it. Many people mistake symptoms from colds and other illnesses for the flu. Myth #25: I never get the flu, so I don't need the shot. Fact: You can't predict whether you'll get the flu. Myth #26: I can protect myself from the flu by eating right and washing my hands regularly. Fact: A good diet and good hygiene are healthful habits that reduce the risk of illness but cannot prevent the flu on their own. Myth #27: It's OK if I get the flu because it will make my immune system stronger. Fact: Even if the flu in a future season resembles a strain you've had before, the protection is likely to be incomplete and fades over time. Flu weakens your immune system while your body is fighting it and puts others at risk. Myth #28: If I do get the flu, I'll just stay home so I'm not infecting others. Fact: You can transmit the flu without showing symptoms. Myth #29: Making a new vaccine each year only makes influenza strains stronger. Fact: There's no evidence flu vaccines have a major effect on virus mutations. Myth #30: The side effects of the flu shot are worse than the flu. Fact: The most common side effects of the flu shot are mild, such as headache, fatigue, cough, low fever and arm soreness lasting a couple of days. Fewer than one in a million people experience severe allergic reactions. Myth #31: The "stomach flu" is the flu. Fact: The stomach flu refers to a variety of gastrointestinal illnesses unrelated to influenza. Myth #32: If you haven't gotten a flu shot by November, there's no point in getting one. Fact: Getting the flu shot any time during flu season will reduce your risk of getting the flu. Editor's note 3:08 p.m.: The response to Myth #8 was reworded to make clearer that vaccination against flu lowers a pregnant woman's risk of miscarriage. An earlier version of this post said that a high-dose flu shot is recommended by the Centers for Disease Control and Prevention for older adults. The shot is an option, but the CDC hasn't expressed a preference for it over the standard shot.